Colloide is a highly skilled process engineering company, with specialist skills in water treatment, energy, environmental and facilities engineering solutions. Our services range from design through to construction, installation, commissioning, maintenance and overall project management. Our experience is wide ranging, from major water utility installations and innovative ‘first of its kind’ district heating projects through to work with breweries on process improvements and biomass heating installations on farms. We have the skills to take on the role of either principal contractor, specialist sub-contractor or equipment supplier, and are equally comfortable and experienced in all roles. Our team of highly skilled and experienced mechanical, electrical and process engineers. Getting the best solution for our clients, through skills, innovative thinking and a flexible approach. Maintaining the highest levels of Health and Safety, with zero reportable accidents and accredited to BS OHSAS 18001. Our integrated quality management processes, accredited to ISO9001 and ISO14001 (2015). 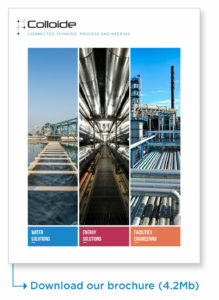 In all cases, we work in partnership with our clients and their consultant engineers and, whether it is a solution to an existing problem or future proofing against upcoming process and environmental challenges, we believe that Colloide is second to none in terms of technical excellence and customer service. We will work with you and your project team from the design stage through to construction, installation and maintenance. We offer an extensive range of technologies and can provide a full turnkey project management service or act as a specialist subcontractor. We have the experience and skills to recommend and design engineering systems for our clients. Whether a new build installation, refurbishment, process improvement or future proofing existing operations, we are always focused on getting the most effective and practical solution for each individual situation. energy centres, heat recovery and renewable energy. Colloide provides a full end-to-end service, from our in-house manufacturing capability through to on-site installation and commissioning. Our in-house skills include mechanical, electrical, chemical and process engineering and project management expertise. Whether working as the primary contractor or a sub-contractor, our engineers are trained to provide a seamless service from installation through to commissioning, process proving and training of client operatives before completing handover. With our commitment to ongoing research, development and training, we ensure that our extensive range of technologies and products stays ahead of the game. We offer clients a range of operation and maintenance services, from planned support programmes and standard warranty back-up, through to a 24 hour emergency call out service. Our team of service engineers are trained to the highest health, safety and quality standard, providing a seamless support service to our clients. Our involvement in a project can range from equipment supply through to a full project management EPCM role. Managing the supply chain, project partners and budget, we ensure that projects are completed on time, within budget, to the agreed specification and with the necessary risk management, health, safety and quality controls. Colloide is committed to maintaining the highest standards of health and safety, quality and environmental management. This commitment is reflected in the independently audited accreditations held by the company: ISO 9001, ISO 14001, OHSAS 18001. Colloide is proud to be accredited with the prestigious Investors In People standard. IiP has long been acknowledged as the most successful framework for business improvement through people, and is a reflection of our commitment to staff training, professional development and personal growth. Achilles UVDB Verify is an independent annual assessment of Colloide’s Safety, Health, Environment and Quality (SHEQ) management systems, as well as our method statements, risk assessments and site procedures. Achilles UVDB is used by utility companies as an independent assessment of potential suppliers. Constructionline independently pre-qualifies suppliers to the construction sector.